The 2013 NFL Combine started this week. Today is a first of a series of recaps of the top players at every position. The Combine is a great place to look at the top players all at one time under the same conditions. It’s easy to get caught up in physical specimens and impressive workouts, but it’s important to remember that the Combine is just one piece of the puzzle. Sure it’s fun to watch guys run fast, and jump high, but draft history is littered with the workout wonders that didn’t make it in the NFL. If a player has a great workout, but his tape doesn’t show the same production, it’s better to trust the game tape. After all, the game is played in pads, not in shorts. This is a good year for offensive linemen. It’s possible that the #1 overall pick may be a left tackle. There are 3 guys that could probably start day one at left tackle. There could even be a guard drafted in the top 10 which hasn’t happened since Chris Naeole in 1997. Some people think there might even be three guards drafted in the first round, which hasn’t happened since 1996. Terron Armstead-OT-Arkansas-Pine Bluff (6-5 306 lbs. ): Small school guy that is definitely making money since the season ended. Has gone from relatively unknown to someone that will be a day 1 or day 2 pick (likely day 2). Created a buzz at the East-West Shrine Game then was a late addition to the Senior Bowl and played well there. 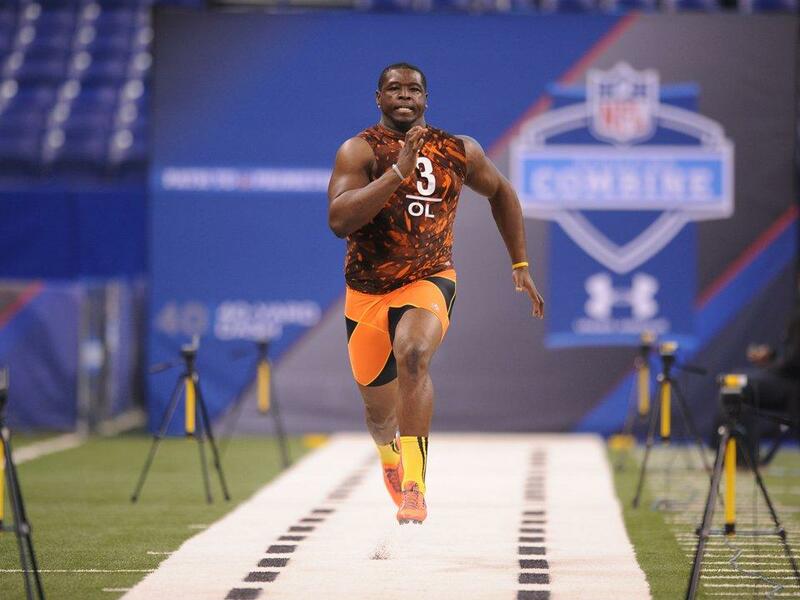 Blew the doors off the Combine by running the fastest 40 yard dash of any offensive lineman since the Combine started (4.71). Also had the highest vertical jump of this group with 34.5”. Bench pressed 31 reps. 9’4” broad jump. Tough player that played all year with a shoulder injury. Smooth, shadows defenders well. Extremely raw, but has good potential. Armstead is the kind of player the Raiders normally jump all over. They love height, weight, speed guys. Johnathan Cooper-G-North Carolina (6-2 311 lbs. ): Very athletic for his size. Does a good job pulling and getting downfield. 5.07 40 yard dash. Bench pressed 35 reps (second best for OL). Eric Fisher-OT-Central Michigan (6-7 306 lbs. ): Continues to impress. Likely a day one pick. Has long arms and the long build to be a successful left tackle. Good pass blocking technique and is rarely beaten for sacks. 5.05 40 yard dash. Bench pressed 27 reps. 4.44 short shuttle. 28.5’” vertical jump. 9’8” broad jump. D.J. Fluker-OT-Alabama (6-5 339 lbs. ): This event is not Fluker’s cup of tea. Where he impresses is blowing defenders off the ball in the running game. Doesn’t move real well. Not quick enough for left tackle, but he’s your man on 3rd and one. Reid Fragel-G/T-Ohio State (6-8 308 lbs. ): Tested very well. Bench pressed 33 reps. 30” vertical jump. 9’5” broad jump. Eric Herman-G-Ohio (6-4 320 lbs. ): Known for pancaking defenders. 36 bench press reps were tops among linemen. Physical and has strong hands. Luke Joeckel-OT-Texas A&M (6-6 306 lbs. ): Possible #1 overall pick. Solid Combine workout, but not spectacular. 37 consecutive starts at left tackle. Has good hip flexibility. 5.30 40 yard dash. Bench pressed 27 reps.
Lane Johnson-OT-Oklahoma (6-6 303 lbs. ): Will be one of the top 3 tackles taken and likely in the first round. Was a quarterback as a freshman. Extremely athletic and runs very well (4.72 40 yard dash and 1.61 for 10 yards). Great kick slide and redirects well. Great feet. 34” vertical. 11’8” broad jump (best among OL). Bench pressed 28 reps. His draft stock is shooting up the boards. Kyle Long-G/T-Oregon (6-6 313 lbs. ): Son of Howie Long. Only started one year at college level. Drafted as a left handed pitcher out of high school. Ran very well, 4.94 40 yard dash. Has good flexibility and bends well. Vinston Painter-OT-Virginia Tech (6-4 306 lbs. ): Only one year starter at college level. Good athleticism. 4.95 40 yard dash. Bench pressed 32 reps. 30.5” vertical jump. Brian Schwenke-C/G-Cal (6-3 314 lbs. ): Continues to impress. Did well in the on field workouts. Very quick off the ball. Good feet. Good fit for a zone running scheme. 4.99 40 yard dash. Bench pressed 31 reps.
Larry Warford-G-Kentucky (6-3 322 lbs. ): Quick, but not fast. Good in short areas. Stays low when he pulls. Very powerful. Bends well at the knees. Blows defenders off the ball. Chance Warmack-G-Alabama (6-2 317 lbs. ): Possibly the first top 10 pick since 1997. Had an underwhelming workout. Struggled in on field drills, but he dominates on tape. Explodes off the line of scrimmage. Good in tight spaces. Menelik Watson-OT-Florida State (6-5 310 lbs. ): Born in England. Only 3 years of football, and only 1 year of Division 1 football. Raw, but extremely athletic. Former soccer and basketball player. Needs time to develop but has a very high ceiling. No, this site was setup at wordpress.com. It is a site for create blogs. This entry was posted on February 26, 2013 by draftmaniacs in All-Star Games and Combine, Scouting reports and tagged 2013 NFL Combine, 2013 NFLDraft, Alabama football, Chance Warmack, Eric Fisher, Johnathan Cooper, Kyle Long, Lane Johnson, Luke Joeckel, NFL Draft, Terron Armstead.